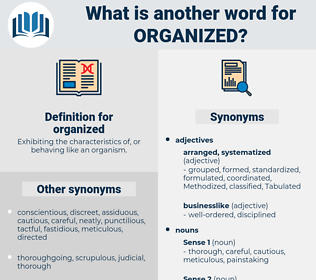 What is another word for organized? Exhibiting the characteristics of, or behaving like an organism. well-organised, Organizations, orchestrated, regulated, co-hosted, formalized, organisational, facilitated, planned, hosted. holds, regimes, partners, schemes, Focuses, Children, Organizations, organizes, hosted. organizers, Hearings, arrangements, Forums, gangs, packages, quotas, exchanges, Organizations, hosted. governed, Mobilized, preparations, coordinated, initiated, preparation, Participated, Managed, appointed, Introduced, Undertook, consolidated, assembled, Convened, Preparing, Commemorated, merged, Contributed, Began, Collated, instructed, amalgamated, ranger, Embarked, Operated, Summoned, Brought, relation, Attracted, represented, presented, constituted, combined, addressed, sponsored, maintained, attended, entrusted, moderated, observed, announced, concluded, struck, assured, Convoked, brokered, sent, Instituted, Installed, directed, ensured, Issued, involved, built, commissioned, Submitted, section, Offered, Entered, Comprising, Promoted, Carried, Proceeded, accordance, Launched, opened, Worked, supported, Filed, Provided, Consisted, charged, Was, Were, laid, Commended, Ran, rose, functioning, started, Threw, arrangements, mandated, Fielded, plotted, Chaired, marked, fulfilled, team, led, included, advanced, featured, Supplied, Schedules, continued, loaded, completed, paid, put, said, welcomed, Gave, posed, Took, Caused, Went, Resulted, called, Fitted, founded, kept, placed, required, Wished, Had, unit, Met, Got, made, Organizations, co-hosted, facilitated, planned. Initiating, Realizing, operating, staging, Occurring, being, screening. categorized, recognized, characterized, governed, integrated, Mobilized, orgnanized, synthesized, summarized, encouraged, coordinated, reorganised, initiated, co-organised, determined, Generated, organizsed, assigned, categorised, region, Administered, rearranged, Participated, realized, Managed, disaggregated, Constructed, appointed, Introduced, Undertaken, guaranteed, defined, regrouped, consolidated, nominated, apportioned, assembled, realigned, designated, concentrated, ordered, seminar, establishment, distributed, Convened, collected, forged, conceived, Compiled, Engineered, configured, formulated, Enacted, considered, learned, Replicated, Devised, located, Deployed, co-sponsored, disorganised, Examined, merged, Contributed, insured, proposed, Collated, dispersed, mediated, instructed, animated, amalgamated, identified, allocated, designed, educated, invited, joined, Embarked, Operated, Summoned, tailored, Inventoried, classified, Begun, Brought, represented, anticipated, amended, presented, constituted, combined, Afforded, mobilised, selected, addressed, Rendered, sponsored, accomplished, outlined, maintained, recorded, aligned, geared, equipped, discontinued, society, attended, Obtained, movement, unified, entrusted, repeated, centered, suggested, grouped, subdivided, moderated, measured, granted, executed, reported, observed, connected, taught, Accommodated, intensified, Aggregated, dedicated, Enabled, scattered, concluded, reunited, imposed, Urged, struck, assured, Drafted, resolved, sent, financed, curated, constitution, Instituted, Installed, directed, solved, transmitted, committed, reviewed, accumulated, ensured, split, experienced, Enshrined, adopted, Issued, Benefited, involved, built, restructured, Indicated, chosen, composed, Submitted, Offered, trained, expanded, obligated, shaped, Discussed, associated, Entered, Promoted, foreseen, Carried, Displayed, spoken, adjusted, stored, Launched, accrued, secured, contained, Upheld, found, Prorated, opened, Forwarded, adapted, graded, Hinged, permitted, composition, Achieved, excused, Captured, decomposed, Worked, supported, Occurred, archived, Filed, intended, projected, separated, Lodged, Provided, handled, Consisted, situated, ranked, Targeted, produced, charged, Robbed, programmed, pursued, accepted, settled, devoted, Aimed, bound, Referred, covered, retired, Mapped, document, broken, Favoured, raised, laid, specified, collapsed, heard, spread, guided, activity, received, Rated, sat, fixed, Served, Cantoned, thrown, packaged, clustered, described, related, divided, divides, signed, Exempted, started, dismissed, Been, formatted, sought, subsumed, Regarded, Shown, Followed, arrangements, mandated, opposed, Trafficking, extended, linked, sorted, headed, shared, CODED, Stowed, fight, obliged, booked, plotted, Chaired, spent, reflected, void, marked, Channelled, fulfilled, led, Pooled, included, framed, advanced, Relied, processed, role, Supplied, prescribed, loaded, Reached, Piloted, completed, paid, put, listed, driven, Lumped, Allowed, needed, tabled, Asked, clumped, serviced, services, Classed, expected, added, given, centred, used, welcomed, packed, taken, posed, ', gone, Caused, focused, effected, Resulted, called, Fitted, funded, founded, kept, placed, have, requested, Bundled, required, Had, null, closed, Subjected, type, unit, seen, ", based, done, meetings, Met, Got, made, Organizations, regulated, co-hosted, formalized, facilitated, planned. gathered, implemented, ordered, engaged, Delivered, curated, orchestrated, hosted. gathered, implemented, engaged, Delivered, orchestrated, hosted. organised, preparation, hold, Organizations, throw. snafu, unordered, nonunion, irregular, fucked-up, planless, Immethodical, unsystematic, patternless, broken, hit-or-miss, nonsystematic, shambolic. But you got to hand it to him - he's getting things organized in great shape. It was not the first time attempts had been made to steal his inventions, but on this occasion a desperate and well - organized plan appeared to be on foot.